I’ve been doing a lot of thinking about our responsibility as museums to our communities and cultures, and particularly to reviving indigenous languages. Being in Hawai‘i brings it all home. 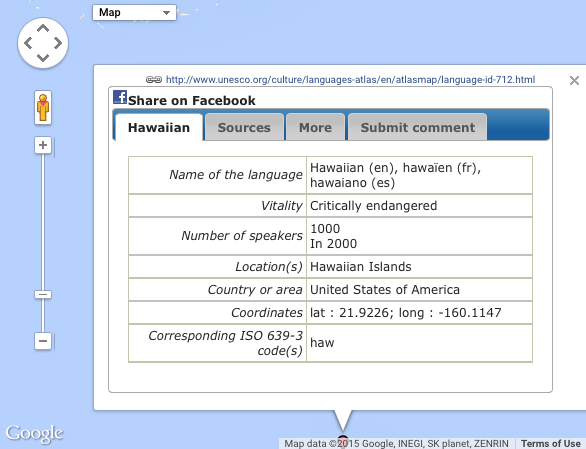 Hawaiian is an official language here, but its vital stats are looking pretty grim. The indigenous language was banned from schools in 1896, as Māori was in Aotearoa New Zealand in the 1860s. That and multiple other policies and events since have made a right mess of things. 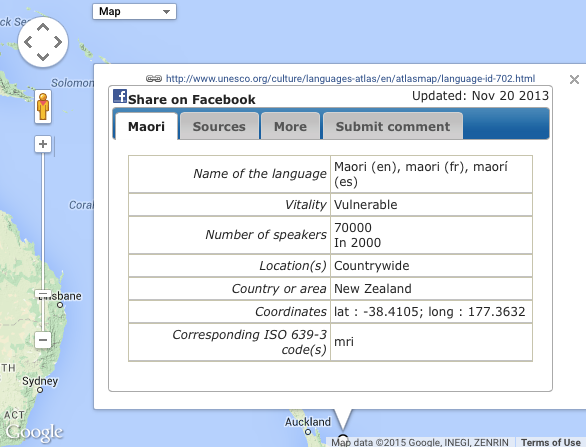 UNESCO’s atlas of endangered languages rates Hawaiian as critically endangered, Māori as vulnerable. If you’re not a numbers person, take a moment to absorb that piece of information, skip the stats, and go to Lou’s story further down. In 2000, UNESCO put Hawaiian speakers at 1,000 (not even 0.1% of the population) and Māori speakers at 70,000 (less than 2% of the population). But the stats seem to differ wherever you look. 2006–08 US census statistics put speakers of Hawaiian at around 24,000. That’s still a fraction of the then 1.3 million population – under 2%. 2013 NZ census stats put Māori speakers at 148,395, or 3.3% of the country’s almost 4.5 million people. 2006–08 figures also show that Hawaiian speakers on the islands are outnumbered by those not only of English but also of Tagalog (Philippines), Japanese, Ilocano (Philippines), Chinese, and Spanish, and on a par with Korean. These figures focus on the speaking of ‘other’ languages in relation to competency in English – as if bilingualism might be somehow detrimental. 2013 census figures lump numbers of Pacific peoples in Hawai‘i together – at 10% – with no reference to Hawaiians as a distinct group. 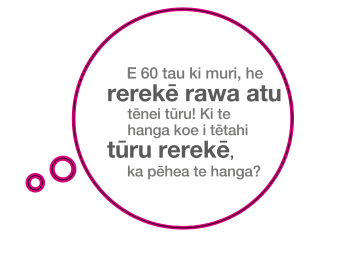 It’s all a bit depressing really, but as in Aotearoa New Zealand, revival efforts (like immersion schools) have been pulling the language back from the brink. 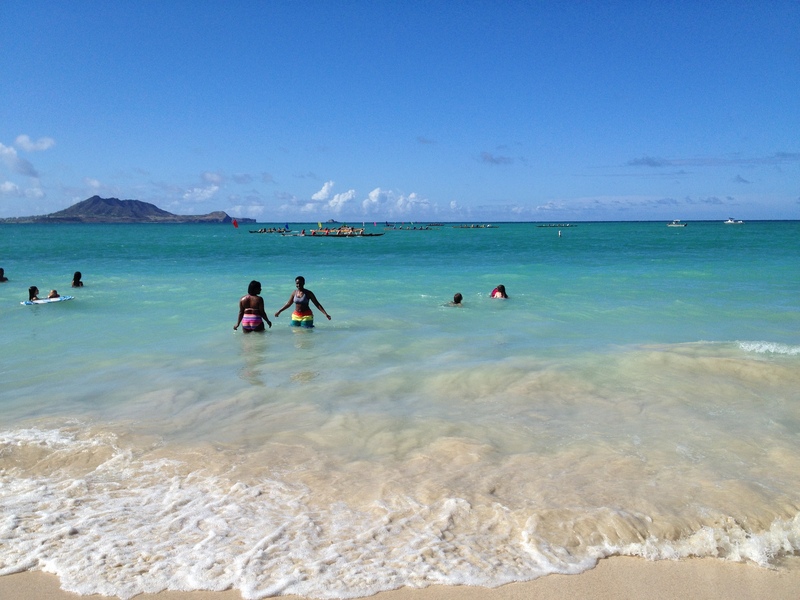 In Kailua, I’m not in the right place to see those efforts, but they’re certainly there. Still, I encountered a woman on the beach the other day who’s passionate about the Hawaiian language. Let’s call her Lou. She’s not Hawaiian, but her family’s fourth or fifth generation. She told me about the first time she heard the language – in a shop in a village, when she was already in her late teens. She stayed reading the back of a can of beans, just so she could listen to the two old men chatting for a little bit longer. She fell in love with the sound. Lou’s in her 60s now and has been attempting to learn since her 30s, but she says she feels ‘iced out’ whenever she tries. Now I don’t really know Lou, but I could tell her interest was genuine at least. She was clearly cut up about it all. One of her early teachers – an elder Hawaiian woman – was supportive but told her that if she wanted to continue learning, she’d need to pretend she was native Hawaiian, not Haole (of European descent). But Lou couldn’t do it. And here’s the longer story on Rachel Dolezal. I feel lucky that at Te Wānanga o Aotearoa, where I’ve done classes in Māori, I’ve been welcomed by teachers and students alike, and that I’ve had the opportunity to learn at Te Papa as well. That generosity of spirit is remarkable, given the history of our nation. I’m also familiar with the discomfort of learning as a Pākehā (New Zealander of European descent), but I’m not going to pretend I’m in any way unfortunate to be in that position. What’s a little discomfort compared to decades of privilege and preferential treatment? I’m a non-Māori New Zealander. I’m acutely aware of the inequalities that continue in our country, of the power relationships, and of the wrongs committed in the past. It’s not OK. But how do we get beyond that? Can Pākehā be part of the revival of the language and culture? And if so, what’s the appropriate role to play? I still don’t know the answer to that – and yet I feel compelled to explore this territory as part of my Fulbright. So where do museums come in? 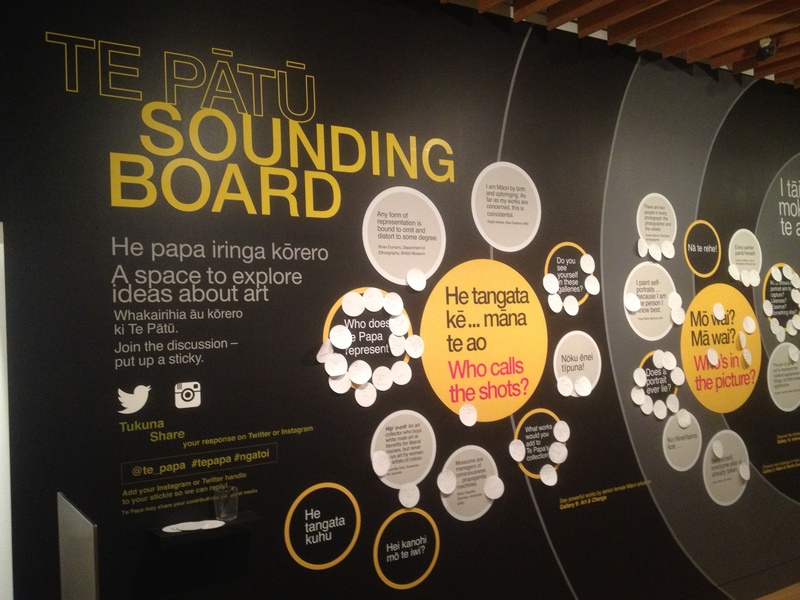 Over the past few years, Te Papa has been aiming for fully bilingual content wherever space permits. Well, I guess if we don’t, we give up. Are we prepared for that loss? And isn’t this one of those ‘big things’ museums are here for? Shouldn’t we be using our collections to solve some of the real problems facing the country and world? Isn’t it worrying that we’re even asking the question of whether to create content in Māori or not? What if we see them as potential speakers rather than non speakers? What if we aim to inspire them to learn? What technologies might help us? What digital tools and other support might they need? And how do we balance their needs with those of fluent speakers wanting the full story in their language? Big questions. No easy answers. But I’m hoping US and Canadian museums can provide some ideas around the delivery of multiple languages. So there you go. I’d be interested in yours. So, I’ve touched down on US soil, though I’m still in the middle of the great Pacific. This is the idyllic family holiday before the Fulbright period begins. But I have planned to visit the Bishop Museum to look at their approach to bilingual and bicultural content. Why am I surprised by the degree of Americanisation all the way out here on Oahu, Hawai‘i? Was I expecting the sort of Pacific welcome you get on Sāmoa or Fiji (hardly untainted by tourism)? More Hawaiian faces? And why, when I come from a land that’s been well and truly Christianised, Colonised, Anglicised, Americanised, and Globalised? Maybe I’m just looking in the mirror and seeing the long cloud of white people (of which I am one) that now covers much of Aotearoa New Zealand. It’s left me uneasy. Course, I’m in the wrong part of Hawai‘i to experience anything else. Kailua. Shamelessly on vacation. The Bishop Museum is a Pacific oasis in the great shopping mall of Honolulu. I’m greeted by the same Pacific gods of home. It still astounds me, the feat of navigation that the Pacific peoples achieved all those centuries ago to settle the islands. No GPS. No compasses. Just the stars and seas and wildlife to guide them. The ties between all these peoples across thousands of kilometres of ocean remain vivid – in the art, language, ancestors. Here, Tangaroa (Māori god of the sea) is Kanaloa. Rongo (god of agriculture and peace) is Lono. Matariki (Māori New Year) is Makali‘i. T = K. NG = N. R = N. A nifty formula – as if cultural comparisons were that simple. 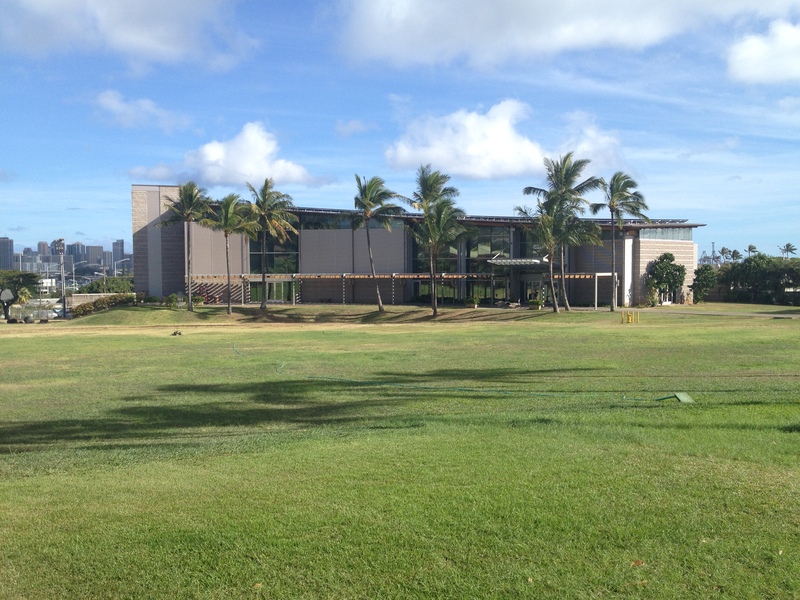 Hawaiian stories are the focus of the museum (as you’d hope), especially in the recently renovated Hawaiian Hall, which is arranged on three levels according to Hawaiian cosmology. 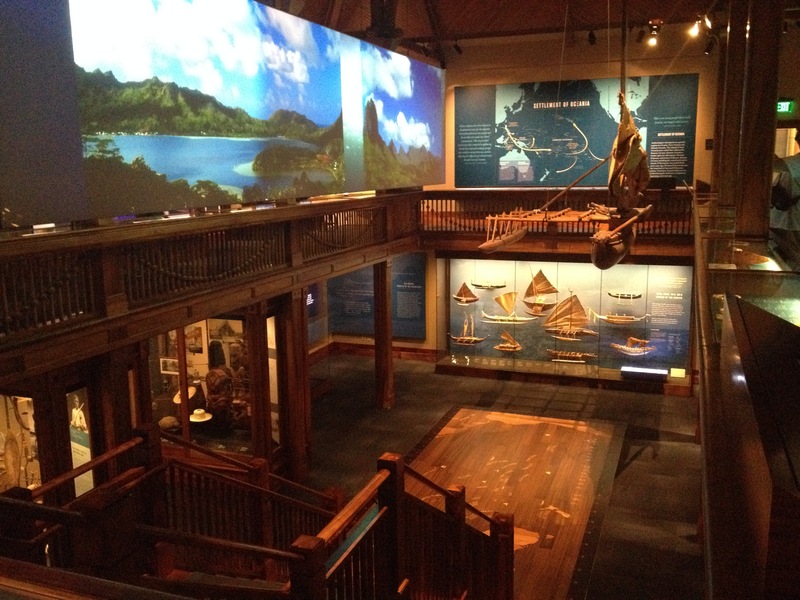 The Pacific Hall takes more of an archaeological view of the wider Pacific. Te Papa tells similar stories, but it’s interesting to receive them via a Hawaiian lens and different, diverse collection items. Brad Evans, Director of Exhibits and Production, shows me the mobile highlight tours they launched in 2013 – in five languages, including Hawaiian. They offer deeper stories on 40 objects. Budget and time were short (sound familiar? ), so they collaborated with university students to record the content. Hawaiian is an official language here, but the Bishop doesn’t have any formal obligation to present content in Hawaiian. Nor is the museum underpinned by a founding agreement like the Treaty of Waitangi (with its principles of partnership, protection, and participation) as Te Papa is. Chants and quotes are in Hawaiian, but English otherwise dominates the interpretive text. Staff have nevertheless decided to make a commitment to Hawaiian via the mobile tours. 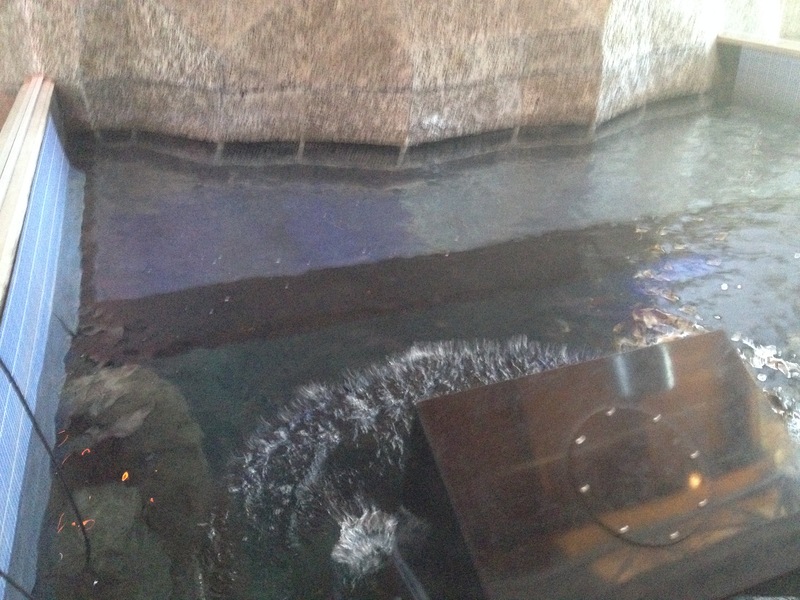 Other languages widely spoken by visitors are also available: Japanese, Chinese, and Korean. The Bishop chose to create the tours on the web, not as a native mobile app, and to embrace BYOD – Bring Your Own Device – because increasingly ‘everyone has a smartphone’. The tours pop up first on the mobile site. They’re audio only, so not too heavy. The aim is that visitors explore objects rather than screens, so there’s no other multimedia or bells and whistles (eg, bookmarking, commenting, sharing, user-curatorial tools). Would uptake really outweigh the additional costs? Visitors don’t need to download a mobile app – the barrier many of us worry about. They can easily access content inside and outside the museum. You can listen right now. The museum can do everything cheaply and in-house and therefore doesn’t have to charge for the experience beyond the museum entrance fee. We talked about the option of using location-based Bluetooth beacon technology to deliver the tours. It hasn’t convinced the Bishop, though Brad describes the current approach as an intermediary one until the technology catches up with needs. Visitors scan a QR code or key in a stop number (as per traditional audio guides) – relevant content isn’t pulled automatically onto their device based on their location. There’s no ‘blue-dot’ wayfinding from stop to stop (though there are still questions around how helpful this really is, and whether printed maps might still be better). The museum monitors website hits (they’ve had more than they expected), and know that the average ‘stay’ is the full length of the audio track. They can’t, however, track how long visitors stay in certain areas of an exhibition or their movements between them, which would (theoretically) allow them to adjust content to meet that behaviour. The tours offer interesting stories, and there are five entries for kids, read (but not written) by them. Some of the tracks feel long, and I’d prefer the basic object info to be onscreen rather than recorded (it delays the juicier stuff), but that’s a minor quibble. 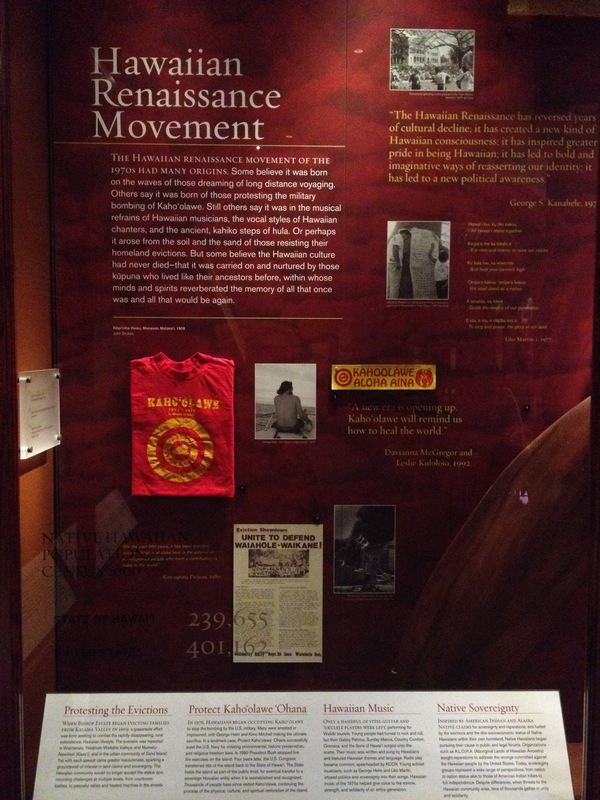 The complex story of the 1898 annexation of Hawai‘i (Kū‘e petitions) is an example of track that gives a useful potted history of content that’s difficult to convey in a cohesive way across objects. I’ll be keen to see how other US organisations are using mobile or wearable devices. Is anyone succeeding in moving beyond the usual audio guide? In what ways are museums encouraging continued interaction with real objects and with other people via mobile offerings (avoiding screen fixation)? Is anyone succeeding in bringing together multimedia mobile experiences with already complex on-floor experiences – or is the competition between those aspects too great? 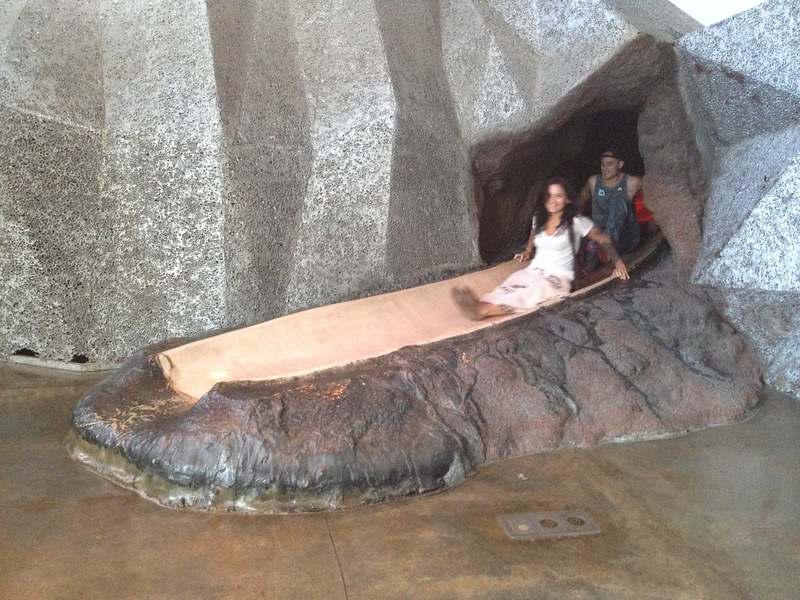 See my blog: Down the rabbit hole with MONA and Melbourne Museum – Part 2. 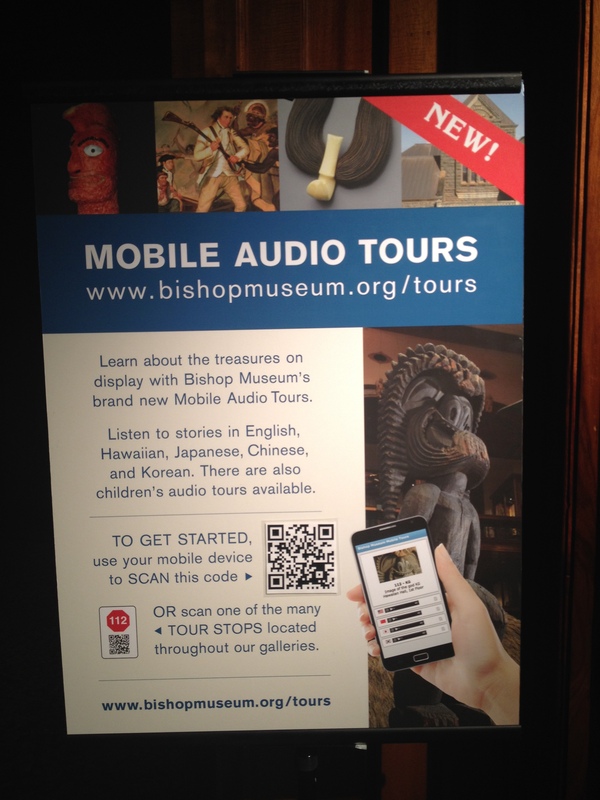 For museums wanting to create an audio tour on a limited budget, however – and potentially provide more languages, stories, and perspectives – the Bishop’s BYOD, web-based approach is an enormously sensible option. Brad muses about the possibility of making the whole museum experience more uniquely Hawaiian – the entrance/shop, food, events – not just to appropriately acknowledge the Hawaiian people and history of the islands but also because … well, why else would an international visitor come to a museum in the middle of the Pacific (especially when there’s a free tropical beach just down the road)? The entrance fee is pretty hefty too – but it’s tricky to avoid that if the funding isn’t there. 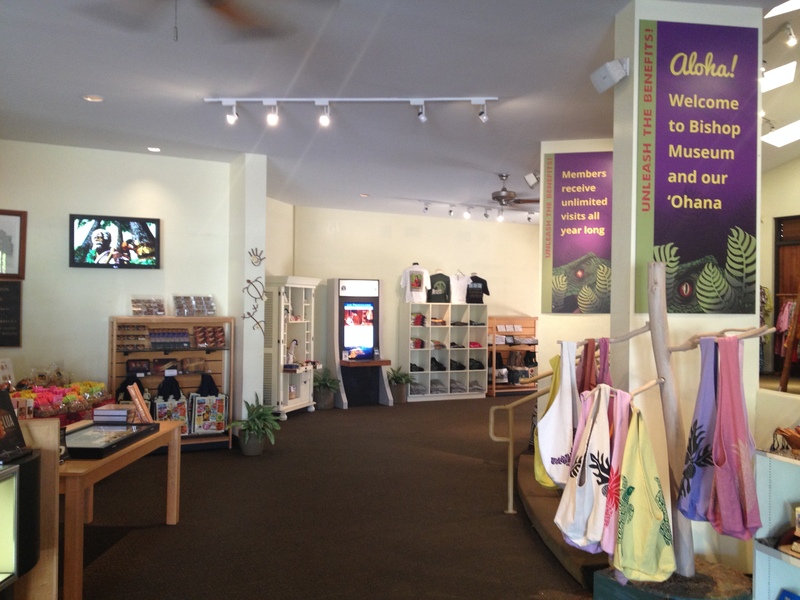 Bishop Museum entrance and shop, 2015. Room for more of the Hawaiian story and experience here? I think he’s right. That’s what Te Papa set out to do when it opened – to create something distinctly New Zealand/South Pacific in nature, not emulate the museums of Europe. 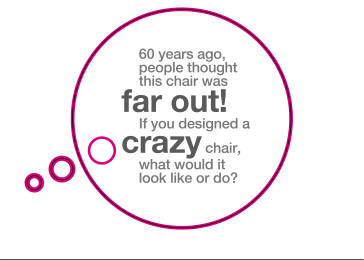 Which isn’t to say we couldn’t do more in that way … but that’s for another time. 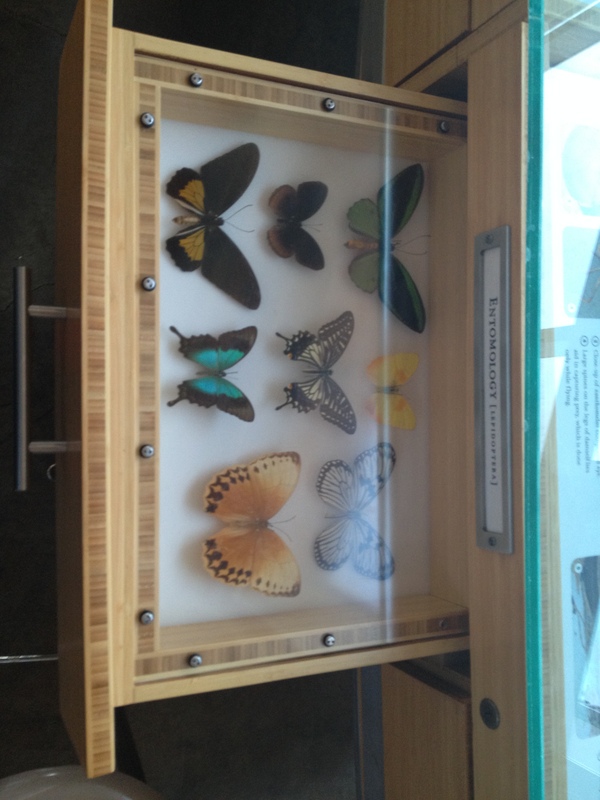 The Bishop Museum’s Science Adventure Center, which explores the natural world, has some particularly cool stuff. 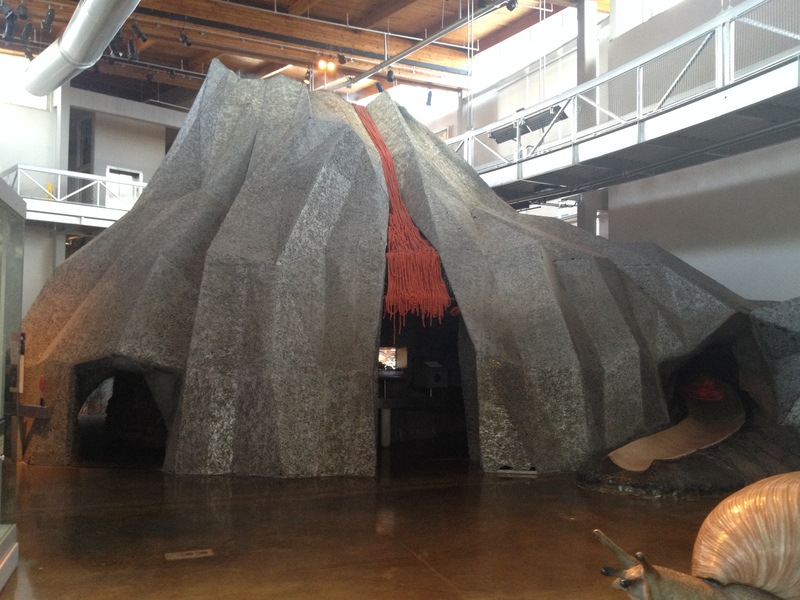 The volcano in the middle – the use of 3-D space to embody the geography of Hawai‘i and related concepts. Nice lava slide and opportunities for play. Drawers full of butterflies. And rats. Always good. The deep-sea dive digital interactive. 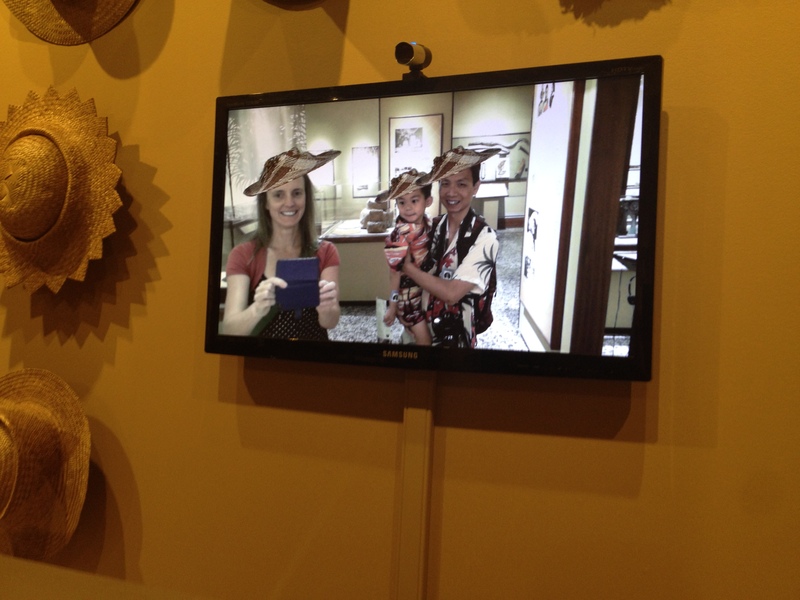 There’s also a nice temporary show on Hawaiian weaving, with a fun hat interactive. My cellphone runs out mid afternoon, and suddenly I’m glad to be ‘back in the States’ with a Starbucks around the corner where I can recharge. Now there’s the rub. 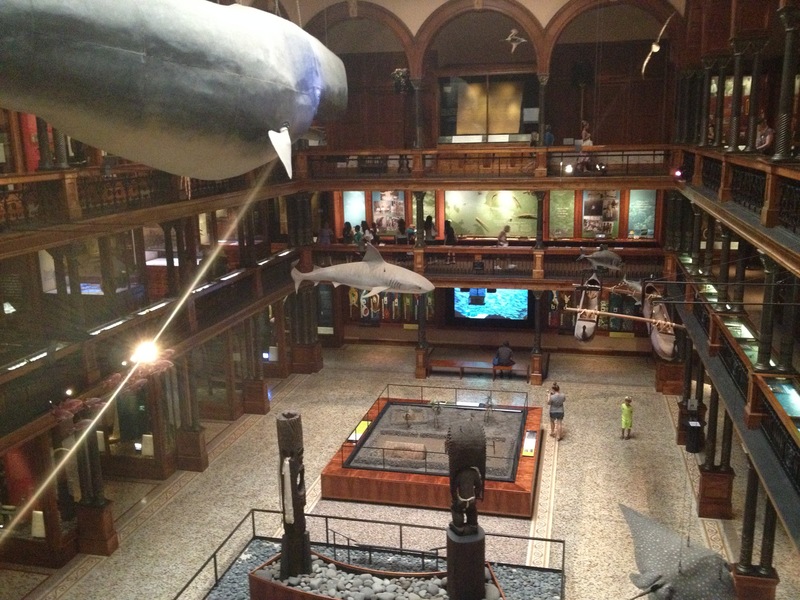 The Bishop Museum: 21.3000° N, 157.8167° W. It’s worth a look next time you’re traversing the Pacific. 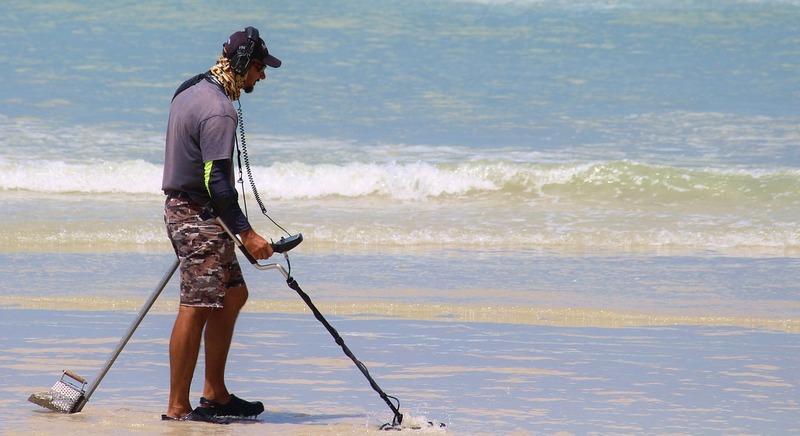 And if you’d rather slow-cook yourself on the beach, then bring a metal detector – it’s amazing how many people are out there hunting for treasure. I guess you never know what fragments of history might be buried in the sand.